Want to start reading from the beginning? Click here for chapters One and Two. To read about why I'm serializing my entire YA novel for free on this blog, click here. 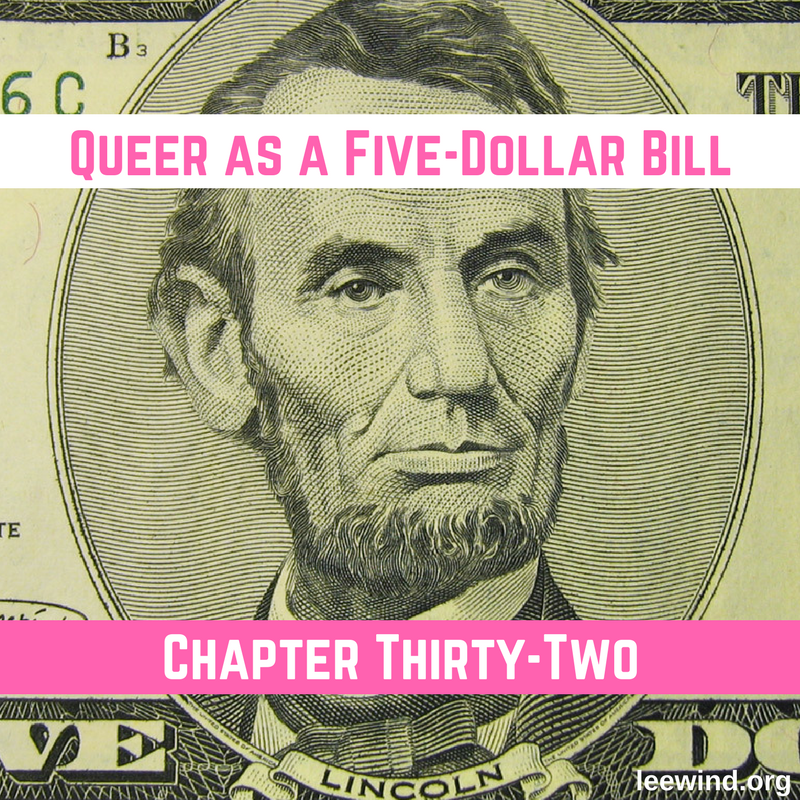 Okay community, here's Chapter Thirty-Two! Orange and white road barriers and groups of high school guys in yellow John Wilkes Booth Appreciation Society T-shirts blocked the way to Union Square on Grant and Johnson streets. The moon was more than half full, and Wyatt used the light to backtrack to 6th Street and head to the park above the stream, figuring he could sneak in that way. He passed four empty buses, and everything was eerie-quiet as he came around the corner of the Log Cabin. It was foggier here. The first soldier handed porto-potty guy his rifle. “At least we don’t have to shave.” He took a sip from a take-out cup as they headed to the square. “You never get the close-ups if you do.” Porto-potty guy agreed. Wyatt hurried to follow them, trying to look like he belonged in the Butternut Gray uniform he’d borrowed from their military mannequin. The wool coat itched and he pulled at the yellow bandana on his neck. He’d tied it too tight. A snare drum rolled, echoing through Wyatt. He walked into the mist and as it swirled away from his legs what he saw was unreal, like stepping back in time. Two hundred Civil War soldiers stood in silent formation, everyone staring up at a waist-high stage ringed by bright oil lanterns. It was where the metal arch spelling out ‘Lincolnville’ had been but that was gone. Three men stood on the stage, one with a canvas sack over his head and his arm in a sling. The other two wore officer uniforms. Wyatt wove his way forward, trying to make sense of it. The soldiers all around him looked so real. Like his soldier in the photo come to life. No one glanced Wyatt’s way, but he was glad it wasn’t daylight yet. Suddenly, the drumming stopped, and everyone slapped their rifles to their sides at attention. Wyatt got his Springfield rifle from their display case in position and tried to look like a soldier. He reminded himself that some real Civil War soldiers had been younger than he was. He was five rows from a heap of scrap wood piled between the soldiers and the stage. His bandana was too high and the jacket collar continued to be super itchy, making him wish it wasn’t buttoned up all the way. When was the last time they’d cleaned this? He thought about Martin and his dust mites, and how those microscopic insects really did look like aliens. His neck itched worse, like the mites or alien lice or whatever they were had realized that instead of plastic, they finally had human flesh to eat. But Wyatt didn’t dare move. Everyone but the officer walking the row was completely still. Wyatt kept the forage cap low on his face as the officer approached, hoping the mix of oil lamp and pre-dawn fog would camouflage him. The officer’s brown and shiny brass scabbard with a sword in it came to a stop right in front of Wyatt. A fringed gold sash covered the officer’s belt and knotted at his right hip. Slate-blue wool pants tucked into high leather boots turned directly towards him. Hesitantly, Wyatt looked up at the officer’s face…Mackenzie’s dad! Mr. Miller stared at him and Wyatt tensed up, expecting Mackenzie’s dad to shout, blow Wyatt’s cover, and kick him out of there. But Mr. Miller didn’t say anything. He just gave Wyatt a you-be-careful look and started walking again. The guy with the goatee walked forward, arms raised in a rock star way that set off alarms in Wyatt’s head. The goatee was new and he was in period uniform, but Wyatt would have known those cowboy boots anywhere. The soldiers around Wyatt jeered and booed. They did have wax-Lincoln! Was that him under the bag? And where was Mackenzie? He’d been so mad at her, but then she went and told him about this…Wyatt’s eyes searched but he didn’t see her. 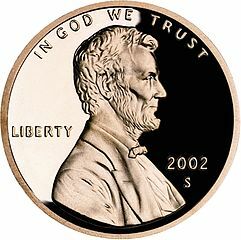 With that, the shorter guy pulled the canvas bag off the third guy’s head, revealing wax-Lincoln. His right arm that was usually out to shake was tight to his chest in a makeshift sling. He was gagged, and his hair stood up on one side, which made him look scared, even though Wyatt knew it wasn’t real. Despite everything, it was good to see him. Before Wyatt knew what was happening, three soldiers rushed on stage, carried wax-Lincoln down, and pushed him standing up into the middle of the stack of scrap wood. They piled the pieces higher on his legs. They had timed it perfectly, shafts of sunlight just cresting the Cascade Mountains behind Wyatt. Wyatt’s feet felt frozen in place. Von Lawson whipped the oil lantern through the air and it smashed at Lincoln’s feet, an exploding ball of glass shards and fire. The wood, which must have been soaked with lighter fluid, erupted into flames. Wyatt watched, horrified, as Lincoln’s face sagged in the heat. His suit was on fire now, and the wax figure kept melting, sloping down like a pyramid in the flames. Von Lawson’s satisfied expression was lit by the fire consuming Lincoln, as the soldiers in their rows cheered. In minutes only the metal armature of the statue was left, and even that toppled and fell into the flames. The soldiers stopped their shouting and for a long moment everything was silent. A woman dressed in jeans and a sweater walked forward with a megaphone and addressed the crowd. “And… that’s a wrap! Thank you, and our P.A. Jessica will have your cash for you on the buses.” The soldiers broke formation and she put the megaphone on the edge of the stage. Von Lawson high-fived her. “I can’t wait to get this footage to the edit bay.” She told him. Wyatt walked closer, spotting Jonathon in a yellow John Wilkes Booth Appreciation Society T-shirt. He was standing with his parents and sister by some of the crew who were taking down the large film-shoot cameras. Wyatt saw his chance and cut past the burned down fire to grab the megaphone. He pressed a button to talk and a siren blared. Ow, that hurt his ears. Everyone stopped moving. Wyatt tried again, pressing the other button. “What about slavery?” His voice, amplified, carried across the square. Wyatt watched Von Lawson push back through the crowd to face him from 20 yards away. The T.V. host stood there like a gunfighter out of some cowboy movie, about to draw and fire. Wyatt forced his voice to not shake as he pressed the megaphone’s ‘talk’ button again. “What about slavery, Mr. Von Lawson? If the South wins?” Everyone was listening. Watching him. Wyatt felt his face heat up, but told himself it didn’t matter. “Wyatt… Did you enjoy the show?” Von Lawson didn’t need a microphone. Anger pushed everything else aside. “That’s supposed to be good enough? Eventually?” Wyatt snorted his disgust. “And what about all the soldiers like me? One in ten are queer, like Lincoln was. Even back then.” Like my soldier probably was. Von Lawson inclined his head to the fire’s smoking embers. Wyatt looked to see who was behind the wheel. Martin put up a hand and smiled at him. In that instant, Wyatt realized he wasn’t scared anymore. The weight of holding the secret was gone. Everyone there knew he was gay. Some people weren’t okay with it, but that wasn’t Wyatt’s problem – it was theirs. And a lot of people were okay with him being him. Some of the people who had been to his blog. And probably all of the ones coming for the parade later this morning – fingers crossed some people would show up! But it wasn’t about what strangers thought. There was his dad and mom. Mackenzie, and Jennie and all their friends who had been watching his back at school. And Rhonda. Martin. Most of all, himself. He was okay with it. Okay with being 100% Wyatt. Wyatt leapt into the back of the pickup, took off the bandana and belt set with his bayonet and, Superman-style, pulled off his wool jacket. The leather suspenders holding up his Butternut Gray soldier pants framed the Super ‘G’ on his chest. It was time to be his own superhero. The boxes of Lincoln hats were by his feet. But he had the one from wax-Lincoln, which even though he knew was imitation beaver fur, felt more real now than ever. He picked up the hat in one hand and the megaphone in the other. Von Lawson had said they didn’t have a Lincoln, but he was wrong. “RAAAHHHHH!” “Get him!” “Shut him up!” The truck got rushed by twenty shouting guys – from school and the Freshman basketball team – all of them in yellow John Wilkes Booth Appreciation Society T-shirts. They started pushing it sideways, rocking the whole pickup back and forth. “Wyatt!” Mackenzie screamed, and he saw her running towards the truck from the other side of the stage. More people were coming behind her. Martin shouted, “Hold on!,” a grinding sound telling Wyatt that he was trying to start the engine. Wyatt clung to the cab roof as the arbor snapped and its top crashed to the truck bed, missing him by inches. He was sure they were going to flip the truck over. “Stop!” Someone in a yellow shirt was waving his arms. Wyatt looked at him, wide-eyed. “Whose side are you on?” Charlie snarled at his best friend. Jonathon paused. He looked at Wyatt. At Mackenzie next to him. Wyatt wasn’t sure what Jonathon was going to do. The crowd pressed in thick around them with soldier-actors and townspeople drawn to the commotion. Suddenly, Jonathon stripped off his John Wilkes Booth Appreciation Society T-shirt and threw it to the ground. Camera lights on him, he vaulted into the back of the truck. Was that so he wouldn’t get his shirt dirty when they fought? A hard laugh burst from Wyatt’s mouth. One of the boxes of souvenir Lincoln hats had broken open, and Jonathon bent to pick up a stovepipe hat made out of heavy paper. Looking right at Wyatt, he stood tall and put the hat on his own head. “What the hell?” Von Lawson shouted. The guys from Jonathon’s team, in a cluster around the truck, looked lost. “Count me in.” Becca said, and with a leap hoisted herself up into the truck bed as well. She put a hat on her head and crowed, “I’m Lincoln!” She hugged her brother and put her hand out to Mackenzie, who clasped it. “I’m Lincoln!” Martin beamed at Wyatt, and pulled on a hat. “And I’m Lincoln!” That was Jennie. “I’m Lincoln!” Sandee, from the candy store. And more soldiers, and townspeople, like a wave. “I needed you to be a big deal.” Jonathon said. Wyatt gave him a what-does-that-mean? pop of his hands. “So I was your Darth Vader?” Wyatt asked. Not much of a compliment. That explains the Death Star. “Guys, it’s quarter-to-eight!” Martin looked up from his phone. What looked like half of the soldiers started to move in a group to block Route 37 at Johnson Street. Wyatt looked at Mackenzie, Martin, Jonathon, and Becca, but didn’t know what any of them could do to stop it. “Enough play acting!” Mr. Miller pushed through the crowd to get in front of the men heading into Johnson Street. His costume outranked them, but would they listen to him? Mackenzie seemed to hold her breath. Wyatt noticed Mackenzie’s hands ball into fists. Wyatt saw Mackenzie’s proud look as she watched her dad. The mass of men hesitated. “Please.” Mackenzie said it quietly. Almost like a prayer. They waited to see what the crowd would do. Jonathon put his arm around Mackenzie. “How about one of them hats, if we’re staying?” One of the soldiers called up to them. He nodded at her, grateful. Mackenzie, Wyatt, Martin, Jonathon, and Becca passed out Lincoln hats to the crowd that surged forward. No one went to block the street. The tide had turned, in their favor. Wyatt spotted Von Lawson slink off into his Limo and drive away. Good. “I wish I hadn’t.” Jonathon said, like he really meant it. “I think you really are.” And with that, Mackenzie kissed him. Wyatt looked away, but this time, not out of anger, or betrayal, or hurt. He wanted to give them a moment of privacy. After all, Mackenzie was his best friend. And, he realized, he was happy for her. Want to know why I'm serializing my entire YA novel for free right here on this blog? Click here. Ready for the book's final chapter, Chapter Thirty-Three? It will be posted on April 20, 2018. Thoughts? Reactions? 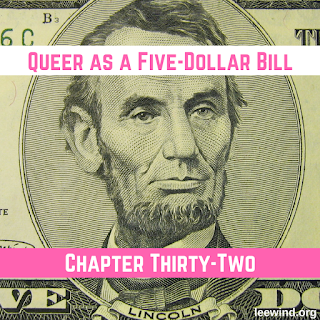 #queerasafivedollarbill / #qaafdb fan art? Share them in comments here, or on facebook, twitter, or instagram. Don't miss a chapter - you can sign up to follow this blog and get emailed every post! Just enter your email at the top of the left column. Thanks for being part of my community, and for being one of my READERS! The "Queer as a Five-Dollar Bill" Press Kit!